Plant Hanger Material: Made of natural jute material with stainless steel key ring, .It is made of high quality cotton, strong and durable. not easy to deformation, corrosion resistance. Plant Hanger Color: Natural color fits for most colors and patterns flower pots. Size of Perfect Plant Hanger: 3 Pcs 41.3 inches Length, 3 pcs 35 inches, Ideal for planters up to 10 inches in flower pots, Different heights allow your overall decor to be varied. 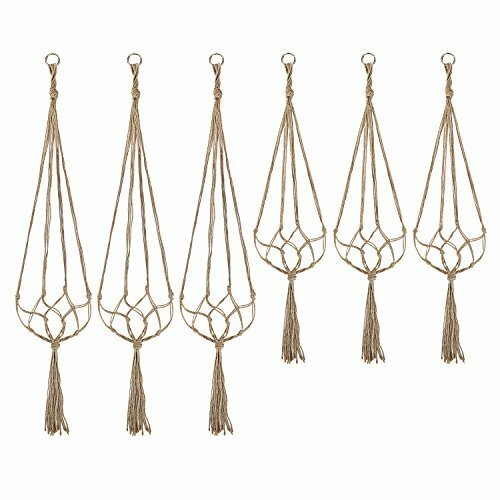 MATERIAL OF PLANT HANGER: Made of natural jute material with stainless steel key ring, .It is made of high quality cotton, strong and durable,not easy to deformation, corrosion resistance. If you have any questions about this product by ANJOSE, contact us by completing and submitting the form below. If you are looking for a specif part number, please include it with your message.